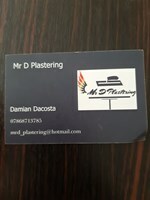 Mr D also known as Damian, has been working as a professional plasterer for over 15 years, he specialises in plastering of all types as well as painting and decorating. Mr D has worked with many different companies and individuals on different properties such as; domestic to offices, shops, restaurants, new buildings and sites. Mr D is hard working, friendly, reliable and is always timely. Mr D has a fine eye for a beautiful finish and ensures all work is completed to perfection. Mr D likes to leave his clients happy and giving them something to be proud of. "Plastering to a glass smooth finish"